Ever since the start of the Syrian crisis, the Western corporate media has presented the public with a number of human symbols of “Assad’s brutality” and the Syrian government’s “Crimes against humanity.” One by one, these symbols have been revealed to be the frauds that they are whether it is “Syria Danny,” “Gay Girl In Damascus,” “Little Omran,” or others. 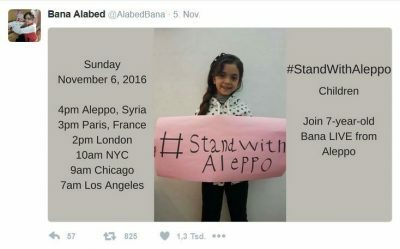 One of the more recent propaganda stunts is the use of a seven-year-old girl named Bana al-Abed. Bana’s alleged Twitter feed has been used and cited by the Western media as not only a tired symbol of the “evil Assad government” but as a rather transparent tool of anti-Syrian propaganda. However, as time moves on, the little Twitter star is being revealed for being much different than what is presented by Western media outlets. In fact, it is rather clear by now that Bana is not a precocious little girl just trying to survive the war but that she (her social media profile) is actually an adult(s), adult terrorist(s), and perhaps a network of people not only connected to terrorist organizations but also to Western intelligence. Bana’s first tweet was simple enough and poignantly framed to gather attention from Westerners who still have hearts, albeit hearts that only bleed when they are told. “I need peace,” her tweet read. After that, Bana tweeted around twenty times, each time complaining about Assad and Putin’s “war crimes” and demanding that both men be brought before the International Criminal Court (ICC). So the question then becomes, if Bana can’t speak English, who is authoring her Tweets? Aside from her lack of English skills, one need only look at the fact that her mastering of the English language as it appears on Twitter is much more advanced than any normal seven year old. This is in addition to the fact that she is able to reference historical facts that few adults (in the Western world at least) are aware of as well as intelligent (albeit wrong) geopolitical analysis. It does not take a highly educated investigative reporter to discover that the Bana Twitter account is entirely fake and nothing more than propaganda. Iyad el-Baghdadi, Louisa Loveluck, Julian Roepcke, Sophie McNeill – all determined supporters of the Syrian ‘revolution’, are very familiar to pro-Syrian activists who spend any time on Twitter. Bana is also following the pro-terrorist National Coalition of Syrian Revolution and Opposition Forces and the White Helmets – the fake humanitarian organisation that presently has a petition calling for a No-Fly (i.e. NATO bombing) zone in Syria. A particularly sinister choice is @IranArabSpring, which is focused on regime change in Iran, presumably by the same bloody route. I highly encourage accessing Barabara McKenzie’s article “Syria: Child Exploitation: Who Is ‘Bana Of Aleppo?’” for a sizeable sample of Bana’s tweets. Tim Hayward of 21st Century Wire has written an insightful piece regarding Bana’s family entitled “Bana: The Heartbreaking Story Of Child Exploitation, Propaganda, And Media Falsehood,” where he sources the work of Syrian journalist Khaled Iskef, who lives in Aleppo. Ever since the liberation of East Aleppo, Iskef has been able to travel to the Eastern portion and investigative a number of elements of the war that had previously gone unreported. In this latest video, Khaled takes us on a short walk around the Alabed house and environs, accompanied by Nour Al Ali doing the filming and photography. They show us into the Alabed house, and then into the Al Nusra headquarters adjacent to it. The proximity of the house to the Al Nusra headquarters is demonstrated – each a few meters from a shared street corner. This explains why the house was in an area being bombed. About 100 men were quartered in the basement of the adjacent building, according to a local witness interviewed. We learn about the Alabed family. The paternal grandfather was running a weapons dealership and repair workshop for Al Nusra and other militant groups; his sons worked there; one of them had served a criminal sentence, even before the war, for gun smuggling; and we are shown a photo of the now famous granddaughter at about 3 years posing with a serious-looking weapon that is as big as her. Her father Ghassan worked as a lawyer, before joining the armed groups. We see photos of Ghassan, armed, with the militant factions Al Nusra and the Islamic Safwat Brigade. We see documents showing he served in the Sharia Court based in the ‘Eye Hospital’. Amidst other papers strewn about the abandoned house is one that indicates he was ‘assistant director of the Civil Registry of Aleppo Council’ – a “rebel” organisation with links to foreign states and armed groups in the governorate. Another document shows he worked as a military trainer and investigating judge for the Islamic Safwa brigades. Prior to 2015 he had been working with ISIS in the Sharia court in the Eye Hospital. We see a photo of him brandishing an AK47 beneath an ISIS flag; and another of him in the midst of an armed Asafwa group. We see him with four brothers, each holding a serious weapon, outside the store. Also lying around is a dog-eared piece of paper with one of Bana’s famous #StandWithAleppo messages on. Outside, and a few steps just around the corner, we are taken into the basement. We are now inside the headquarters of Al Nusra. There we see rolled militant flags, Turkish supplies, and a prison. On this and the other videos there is much more to see. So I recommend them. They don’t have the slick production values of Channel 4 and the other corporate media outlets. What they do offer is honest and dispassionate testimony. Or as dispassionate as a participant observer can be under the circumstances. As a resident of Aleppo, Khaled is visibly affected by the whole situation. He expresses something close to despair about “the exploitation of children in politically motivated attempts to distort the image of his government.” His fellow citizens in that part of town have confirmed on the video that they had been human shields for the militants. Khaled also has a word about the little boy Omran who, photographed in the orange-seated ambulance, was another major media sensation in the West. We meet Omran today in videos with Khaled (and others, like this and this). He is in Aleppo, back in his original home, not Turkey. He was thrust into the world’s media spotlight against his family’s wishes. His family is glad Aleppo was liberated from the likes of those that created the propaganda for #Bana. Barbara McKenzie, who has covered the Bana Project at length says there is no doubt that the whole show is a scam and that it is nothing more than propaganda aimed to promote the NATO narrative of the war and to demonize the Syrian and Russian governments as well as Assad and Putin individually. No mention is ever made of the terrorists who mow down demonstrators in the streets of eastern Aleppo and prevent humanitarian aid reaching the area. Bana’s family may be in a position to repeat the dubious claim that Russia bombed a school in Idlib, but show no interest in the atrocities caused by hellfire cannon directed by terrorists at western Aleppo. When young swimmer Mireille Hindoyan was killed by a terrorist shell in the Armenian quarter in western Aleppo, the Bana Project, along with the Independent (UK), smoothly implied that this was due to Russian bombing. The purpose of the Bana Project is to create in the outside world a conviction that Russia and Syria are committing serious war crimes by recklessly bombing civilians [eastern Aleppo]. In fact both Russia and Syria have denied that they are bombing in Aleppo, and given that Syria has launched a massive land operation to take Aleppo it seems most unlikely that the alliance is bombing at the same time. 3.) Bana does not live in Aleppo. Personally, I have never heard anyone argue the first two claims as they are ridiculous. Thus, the claims are likely the result of people like Bellingcat himself who wish to create a straw man, debunk it, and then claim intellectual victory. The third, however, is legitimate. There is little way to know for sure at this point, but one question that must be asked is how Bana and her family were constantly able to tweet from East Aleppo when there was no power where she was supposed to be located? Indeed, the independent journalists who traveled to East Aleppo during that time all reported extreme difficulty in accessing the Internet, if not outright impossibility. Thus, it is hard to believe that the Bana Twitter account had access to the only Internet and power supply in the entirety of East Aleppo. At the end of the day, Bana, who mainstream media outlets, never missing a chance to pimp the holocaust, have named the “Anne Frank of Syria,” is just one more in a long line of propaganda figures produced by the U.S. State Department, Western-backed White Helmets, and the corporate media. Ironically, it is now being reported that Bana is preparing a book of memoirs, no doubt a vomit-inducing pamphlet that will be shoved down the throats of Westerners in order to pull on what little heart strings they have left. The evidence is clear, however, where Bana al-Abed may be, she is most certainly not on Twitter.